Help your dog spend his boundless reserves of energy with the Rogz Tumbler Dog Toy. The treat-dispensing toy adjusts to various difficulty levels with a simple twist to challenge your pal’s skills, and it’s great to add different-sized snacks. 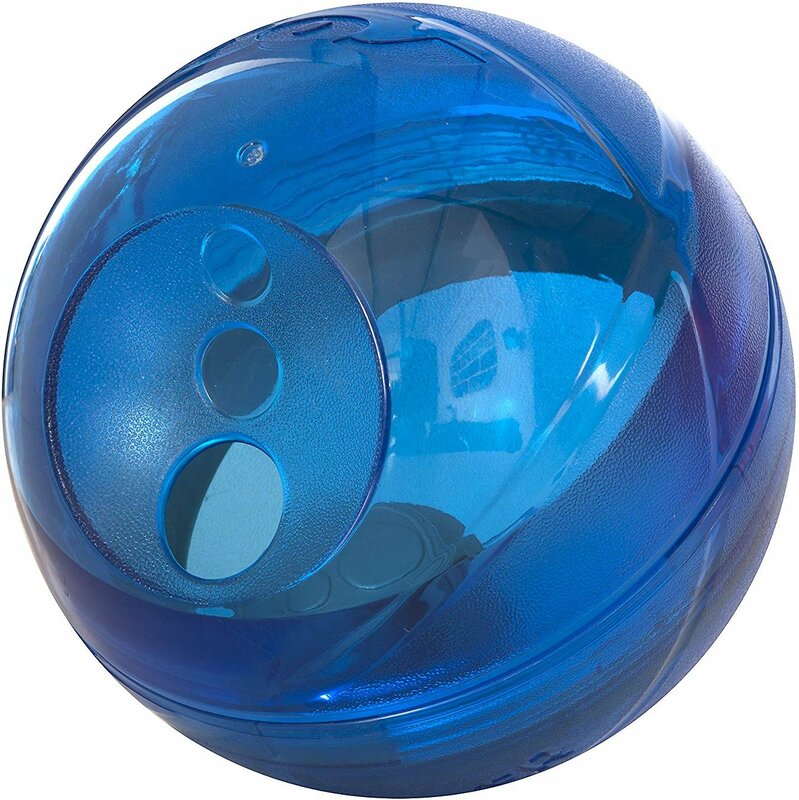 This dynamic rolling, spinning toy keeps your furry friend moving to promote healthy exercise. Plus, the noise it makes, from the treats moving around inside, promotes mental stimulation. Dog toy with adjustable levels of difficulty to challenge your dog for big fun and challenge his skills. 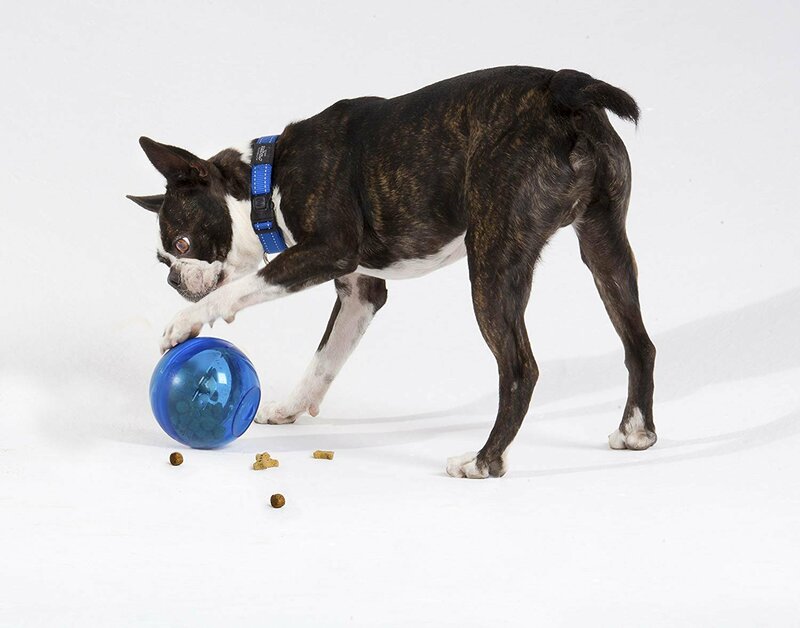 Gradual treat-dispensing toy for extended, independent playtime so your pal can play longer. Durable food-grade material for long-lasting fun, plus it also makes it safe for your dog. 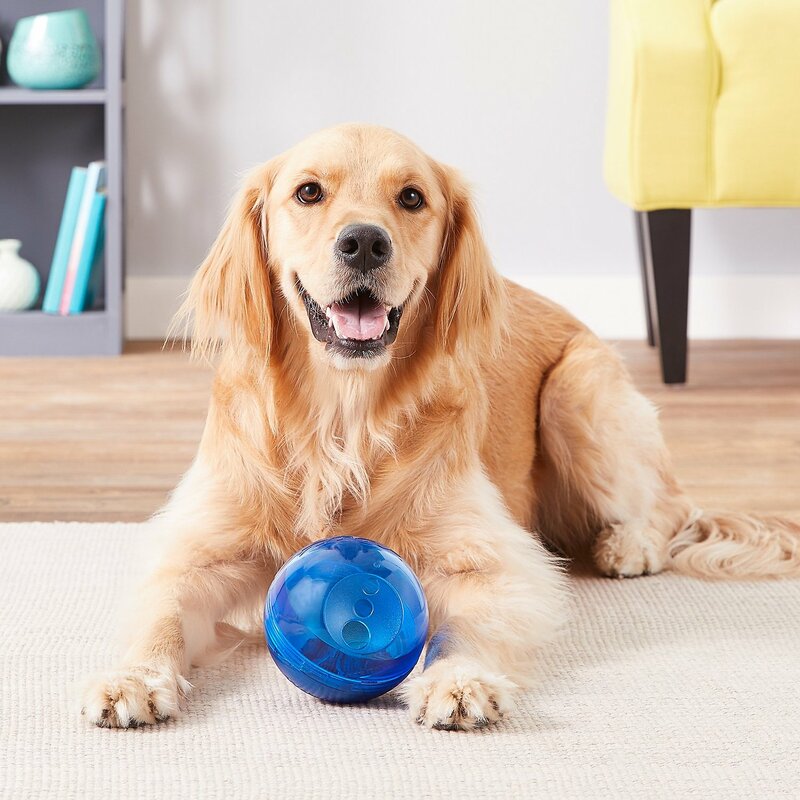 Interactive dog toy that promotes tons of healthy physical activity—keeps your dog moving. Unique see-through ball also promotes mental stimulation since the treats make noise while rolling the toy around. My dog loves this toy! It took him some time to figure it out, but he’s got now. He’s still only able to get the kibble out on stage one, but at least I can increase the difficulty once he masters it. Well worth the money! I have one overly active dog who never tires out- this keeps him super busy! I actually fill it with his kibble instead of treats so he can burn some energy while he eats his meals. It's great, my dog is obsessed! Very disapointed. The plastic is strong but The weight inside does not set in well. It ends up blocking the hole so that treats either all come out at once or not at all. It took a while for my dog to figure it out or even want to go near it. Once he saw my husband and I use it a couple of times; he was hooked. We put some of his favorite treats inside, as he is not as motivated if we just put his food in. Fantastic toy for an energetic pup! This toy has been great for epinephrine y dogs occupied in the evening! They bat it around, and have a blast with it. So far, it’s held up beautifully and they love it...as do I. Perfect even for a hard chewer! My husky pup loves this thing!!! Took him a couple days to figure it out but now even on the hardest setting he knocks the treats out of it like a champ. It can get a little noisy at times as he enjoys slamming it into the baseboards but it keeps him entertained for almost an hour at a time so I am one happy pup owner!!! I have 3 Shelties that are use to interactive toys - we even have two large plastic balls that dispense treats/food. Thought this would be more challenging for my 2 year old puppy. She couldn't get it to roll. None of my dogs could. ALSO, I had trouble opening the tumbler and then closing it - an older person or someone with arthritis would never be able to open it. Ended up just popping the treats into the hole. I ended up taking the internal parts out and it is still difficult for dogs to get it to roll. My Labmaraner likes this, but is still figuring out how it works. He tries to lick the treats out of the hole. Now he’s trying to chew them out. He’s smart. With a bit of help.... he’ll get the gist of it.